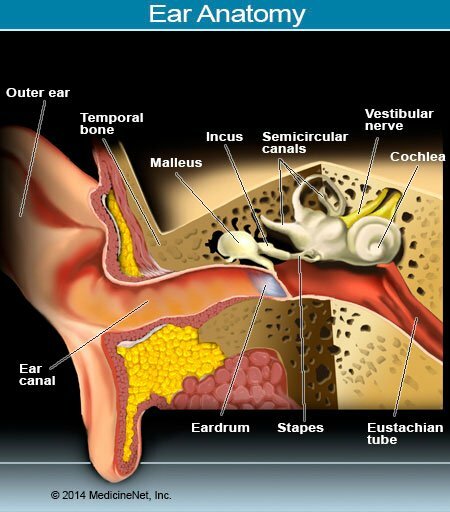 What is an Ear Infection (Middle Ear)? Infection can affect the ear canal (otitis externa), the eardrum (myringitis), or the middle ear (otitis media). Most ear injuries are caused by pressure changes during a direct injury (such as a blow to the ear) or sports scuba diving, but, a persistently painful ear may signal an infection that requires treatment. Because an ear scope (otoscope) may not be available to examine the canal and inner ear in remote locations, starting therapy may be appropriate until a doctor can be reached. The anatomy of the ear. The "760" notes atmospheric pressure in the middle ear. 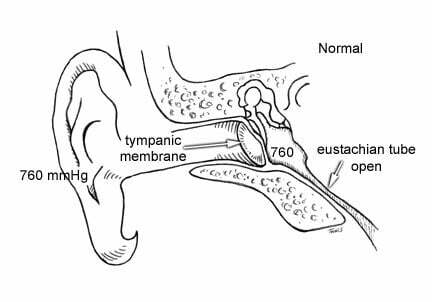 The eustachian tube supplies air to the middle ear. Symptoms may follow a respiratory infection such as the common cold. Discharge from the ear canal is often caused by the infection known as swimmer's ear (otitis externa). A painful ear with decreased hearing is often the result of otitis media, a middle ear infection. Rest: avoid further scuba dives, coughing, sneezing, bending, and attempts to equalize the ears. Pain may be relieved with 1 to 2 acetaminophen (Tylenol) every four hours and/or 1 to 2 ibuprofen (Advil, Motrin) every 6 to 8 hours. For infections of the ear canal (otitis externa): neomycin (Ak-Spore HC, Cortisporin, Neotricin HC, Ocutricin-HC), polymyxin B, and hydrocortisone (Cortisporin, Otocort, Poly Otic), two drops in the ear canal four times per day for five days, may also be used. Fluoroquinolone antibiotics specifically for the ear are also available (ofloxacin, and ciprofloxacin with dexamethasone) to treat otitis externa and otitis media with a perforation or in the presence of ear tubes. If pain occurs, discontinue treatment and seek medical attention. Oral antibiotics are usually recommended for discharge from the ear, nose, or mouth. If an infection develops, continue antibiotics for at least five days after all signs of infection have cleared. Tell your doctor of any drug allergy prior to starting any antibiotic. The doctor will recommend the right antibiotic. Some can cause sensitivity to the sun, so use a sunscreen (at least SPF 15). Some patients may be sensitive to topical neomycin and have further irritation. Seek medical treatment as soon as possible for an examination of the ear if an ear infection is suspected. Seek medical treatment immediately if you experience a sudden loss in hearing in one or both ears (usually occurring over a period of less than 24-48 hours). Elderly people and people with high blood pressure should use decongestants with caution. Consult a doctor about treatment with available medications for an ear infection. "Acute otitis media in adults (suppurative and serous)"
What symptoms did you experience with your ear infection? What was the treatment of your ear infection?